Master It | You Can Master It! Welcome to the MasterIt web site. Our goal here is to help you to master skills in many different areas of life, ranging from computers to art. The site is just getting rolling, so we've got a lot of work to do, but 2 of our courses have been started. We hope that you'll enjoy coming along for the ride! We've activated the Watched Post feature on MasterIt. This allows you to mark specific posts, forum posts and even book pages and have the system send you a notice when things are changed on those pages. Now you can follow activity that interests you without having to remember yourself where it was (or worse yet, add it to the Favorites/Bookmarks in your browser). How are you planning to achieve those goals? Many of us drift aimlessly through life. We don't know where we're headed and we're going there at full speed. But setting goals is hard. Achieving them is even harder. I used to set goals, but I never was able to get anywhere with them so I quit. I can never keep focused on my goals. As soon as I set goals, something or someone comes along and gets me off track. Goals are only for really ambitious people. If you've said something like that then you know how hard it is to have goals. But you know it is very important to have goals in life -- they are targets for us to shoot for. If we don't have a destination in mind we don't know where to go. Who are the best guitarists of all time? I'm sure we all have our favourites, but Legacy Learning Systems has come up with their top 21 list. Yeow! Legacy Learning is getting ready to release their latest Learn & Master Spotlight Series course. This one is for the Bass Guitar. I remember when I was in Grade 8, I wanted to play the electric bass in music class -- got stuck with the trombone. Is there any justice? 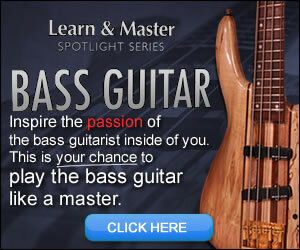 If you've wanted to learn how to play the bass, this is your chance to get some first class instruction. Tony is a professional bassist who has worked with the likes of Brian Littrell, Phil Stacey and Mandisa. This spotlight course is available starting April 30, 2010. It will be offered at $59 at that time, but right now you can pre-order it for $49 -- that's $10 off. They are taking pre-release orders right now but this ends on May 2, 2010! So get on over to Legacy Learning and get yourself a copy. P.S. When is the Learn & Master Trombone spotlight coming out? Privacy is something to which everyone is entitled. We will keep data that is collected as you interact with this web site in strict privacy. We will not disclose your private information to any third party without your express permission. The information that we collect will only be used for those purposes that have been disclosed to you. Legacy Learning Systems and Gibson have teamed up to produce a must have app for the iPhone. Well, must have if you're a guitar player at least!